Danny & The Champions Of The World are in a league of their own – and they're planning to score a winner when they showcase their new album at the Hare & Hounds in Kings Heath on September 29. 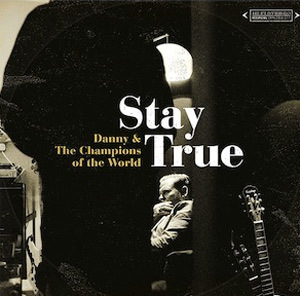 Stay True is the fourth album from the Folk Rock collective formed in 2007 by singer and guitarist Danny George Wilson after the dissolution of his previous band Grand Drive. Alongside Danny in the current line-up are Chris Clarke (bass, vocals), Paul Lush (guitar, vocals), Steve Brookes (drums, vocals), Geoff Widdowson (saxophone, organ, vocals) and Rosalie Deighton (vocals). During the recording of Stay True they were joined by some of the musicians from the original Champs line-up, including Robin and Joe Bennett of The Dreaming Spires who are the support act at the Hare & Hounds gig. There are also collaborations on the record with London bluegrass outfit Foghorn Leghorn. Danny says: "The musicians all stood around the microphones in the same room - booze flowing, smoke filling the air, it was like a polka night but with banjos! Generally it felt like we were making something special, I just booked the studio and the guys heard the songs for the first time on the studio floor. The dream of actually capturing a true first take, something happening for the first time became reality and I'm thrilled with the result. You always hear stuff later that you may have done differently, but you can never beat the feel of a band playing something for the first time. It's very easy to make perfect records these days but I can't think of anything more boring." He continues: ''His first job was keeping the jukebox stocked with the hits back in the '50s in his folks' Milk bar in Melbourne, so he can name pretty much any doo wop or R'n'B hit within the opening bars - a great education. He saw Buddy Holly - now there's qualifications for you!" Danny has been touring the world and making records for nearly 20 years. Six Grand Drive albums were released as well as a Danny George Wilson solo offering, Famous Mad Mile.